In the viewings of The Donna Reed Show and The Gilmore Girls there were comparisons of what an “ideal wife” should be and what modern women in today’s society are. 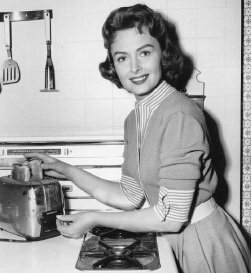 The Donna Reed show was based in the 1950’s in a time where women returned to maintaining the household while their husbands made the family’s sole income. In The Gilmore Girls, however, the situation varies. The Gilmore Girls is based at the turn of the new millennium and focuses on the modern-day family, which differs from that of the 1950’s. In modern times, it is not uncommon to see a single parent running a household and that is what The Gilmore Girls shows. This modern-day show presents a family that consists of a single mother and her teenage daughter defying the rules of a conventional nuclear family. In The Donna Reed Show, the conventional nuclear housewife deals with the difficulties of maintaining stability within the family as she deals with her personal struggles. Donna feels as if she is being taken advantage of by her family as well as people she interacts with on a daily basis. Donna feels as if she is being taken advantage of by her family as well as the laundromat’s deliver man, who had mistakenly forgotten to return her dress which she needed for a social event. Donna struggles to keep her children and husband in line as well as prevent the laundromat’s delivery man from forgetting her clothing. Although Donna becomes frustrated with the fact that not everything is as perfect as it should be, she maintains her “perfect” image and eventually returns to form. The Gilmore Girls, however, which defies and often mocks the conventional household that was set up by previous programs like The Donna Reed Show. Lorelai Gilmore is not the conventional housewife as portrayed in the 1950’s. She is a single parent dealt with raising a teenage daughter on her own and is not uncomfortable with the idea of pizza or other forms of takeout as dinner each night. While Rory Gilmore seems to be self-sufficient enough to make her own decisions, she finds herself referring to past assumptions on what a woman should be. In this case, she argues with her boyfriend about the conventional nuclear household of the 1950’s and the place of Donna Reed. She eventually ends up dressing up like Donna Reed and making her boyfriend dinner in a neighbor’s house that she is house-sitting. These texts speak to one another because Rory Gilmore is reflecting upon the image given on women in the 1950’s. Since her boyfriend thought it would be nice to have a woman prepare dinner for him every day, Rory thought it would be necessary to show her boyfriend a “Donna Reed night.” Rory prepared dinner and dessert for her boyfriend and finds herself in an awkward situation. Although her boyfriend found the dinner to be quite good, Rory finds herself being mocked by her mother for her attire which consists of a conventional outfit worn by Donna Reed on her show in the 1950’s. This mocking causes Rory’s boyfriend to change his opinion and realize that he does not want a “conventional” woman from the 1950’s.